"Love Like Woe" by The Ready Set from 'I'm Alive, I'm Dreaming,' available now. "Love Like Woe" is track #1 on the album I'm Alive, I'm Dreaming. It was written by Ross, Robert / Pierre, Harve / Best, Anthony / Witzigreuter, Jordan. "Love Like Woe" is a single by the American pop singer Jordan Witzigreuter, also known as The Ready Set, from his second album, I'm Alive, I'm Dreaming. This is "The Ready Set - Love Like Woe" by Isaac Ravishankara on Vimeo, the home for high quality videos and the people who love them. 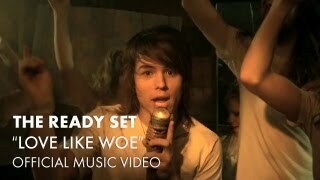 The first digital single, "Love Like Woe," from the debut album from The Ready Set.